SPARKLY LADIES! 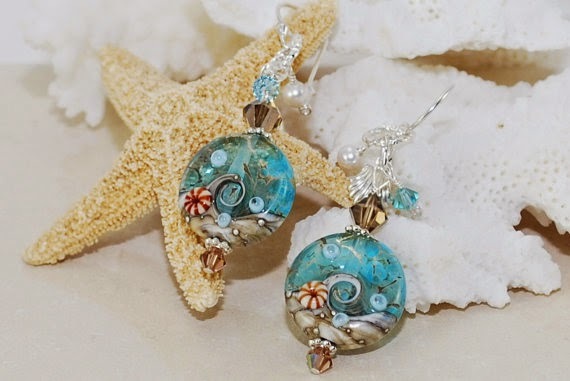 : TUESDAY'S JEWELRY SPOTLIGHT FEATURING MICHELLE OF "ORNATE TREASURES"
TUESDAY'S JEWELRY SPOTLIGHT FEATURING MICHELLE OF "ORNATE TREASURES"
To go directly to my shop page, click here. I am blessed to be a stay-a-home mom of 2 wonderful girls and definitely a craft addict. In addition to designing jewelry, I also enjoy tole painting, scapbooking, cooking, gardening, landscaping, crocheting, photography, woodworking and love to work most of all with my husband on home improvement projects. It is mesmerizing to see all of the beautiful colors and gemstones that God has created! LOVE to work also with Swarovski crystals, seashells and pearls. It is truely a joy to create a piece of jewelry for someone special! My jewelry style ranges from very feminine, to sea or nautical themes, rustic or natural, and sometimes very funky. I am a proud member of CAST (Christian Artists Street Team), CAPS Team, Create in Christ, Handmade Jewelry Team, Handmadeology, Etsy Promotion Forum Team, Etsybead Team and Etsy Success Team.